av George R.R. Martin (forfatter) og Luis Royo (illustratør). An enchanting tale of courage and sacrifice for young readers and adults by the wildly popular George R.R. 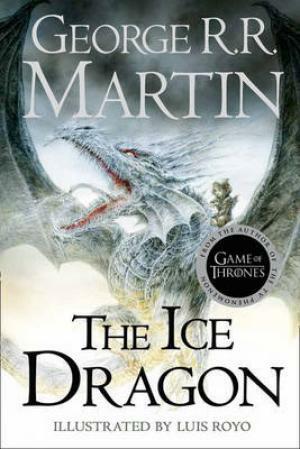 Martin, author of A Song of Ice and Fire, the series that inspired HBO's Emmy Award-winning "Game of thrones". Lavish illustrations by acclaimed artist Luis Royo enrich this captivating and heartwarming story of a young girl and her dragon.From ancient times the ice dragon was a creature of legend and fear, for no man had ever tamed one. When it flew overhead, it left in its wake desolate cold and frozen land. But Adara was not afraid. For Adara was a winter child, born during the worst freeze that anyone, even the Old Ones, could remember.Adara could not remember the first time she had seen the ice dragon. It seemed that it had always been in her life, glimpsed from afar as she played in the frigid snow long after the other children had fled the cold. In her fourth year she touched it, and in her fifth year she rode upon its broad, chilled back for the first time. Then, in her seventh year, on a calm summer day, fiery dragons from the North swooped down upon the peaceful farm that was Adara's home. And only a winter child-and the ice dragon who loved her-could save her world from utter destruction.